With an eye on recent front page news, let’s look back to the time when Snohomish was once a city of bridges. Regular readers may remember last month’s historic image of the Eagles Hall that included a glimpse of the First Street Bridge at the bottom of the image. This month’s photograph is most likely of the very first bridge joining First (or Front) Street across our famous gulch, captured by an unknown photographer around 1885. The Snohomish Gulch is a 30-foot deep memory of the Vashon Glacial Period that ended 10,000 years ago. The resulting ravine was the runoff route from Blackman Lake, first called “Stillaguamish,” to the Snohomish River. In early descriptions, it’s sometimes referred to as “Blackman Creek,” or “Ferguson Creek,” but officially today, it’s “Swifty Creek” – a name of hope and promise. A close look at our historic image confirms this opinion 125 years distant. By the turn of the century, Snohomish, no longer a “Village,” but an incorporated city of the third class, had four bridges over the gulch – at First, Second, Fourth and Fifth Streets. For addtional reading about “Our Snohomish Gulch,” check out Ruth Brodigan Dubuque’s account in “River Reflections, Part II,” published by the Snohomish Historical Society, available at the library and Upper Case Books on First. And, I will return next month with an inside view of the new First Street Bridge. This entry was posted in Posts and tagged Snohomish WA history on June 19, 2013 by warner. Let’s celebrate Historic Preservation Month locally with three cheers, one for each stunning storefront retail space in the renovated Eagles Building which returns this block of First Street once again to an inviting streetscape of community reflection and commerce. For a long time the building’s storefront windows were covered or severally reduced, unconsciously creating an unfriendly streetscape. Just as is the ongoing case with American Legion Post located in the historic Wilbur Drug Store Building, 1201 First, which I wrote about in December 2012. Glass windows reflect the community back upon itself, as we stop to window shop or simply grab a glance of ourselves and others passing by. They reflect the changes in the sky, the passing of day into night, and are like tiny altars to the seasons. Storefront window displays manifest our economic faith in our town. Looking closely at this month’s historic image and noting, in particular, the richness of the frontier window displays – I am in awe of our human endeavors captured so precisely on a glass plate by the photographer Lee Picket, who lived in Index. Stories inspired by these historic storefront windows display still present reflections of ourselves over a hundred years later. This entry was posted in Posts and tagged eagles hall on May 14, 2013 by warner. Make Some Noise for History! [nggallery id=35] Click on any image to begin a slideshow. One of my favorite activities judging the annual History Day Contests is walking through the cafeteria during the lunch break, basking in the noise generated by a room full of excited young historians. What a surprise is was for me the first time several years ago at the Shoreline Center, home of the North Puget Sound Regional History Day contests. For the past two years, I have also judged at the Washington State History Day held at Bellevue Community College which just took place on May 4, 2013. After lunch I soaked in the excitement of waiting for the announcement of the projects moving forward to the final round. Sixty High School historians were selected to represent Washington State at the National Contest, June 9-13 in College Park, Maryland, and I can only imagine the noise they will make! Follow this link to learn more about History Day in Washington State. This entry was posted in Posts, Volunteer Projects and tagged history day contests on May 13, 2013 by warner. My promise to share with you a second, early image of the Eagles Hall is postponed until next month in order to follow up on the front page story in last week’s Tribune – the story of apodments and the vacant structure at 402 Avenue E.
[singlepic id=203 w=260 h=175 float=left]This month’s historic image was first published in the paper, October 24, 2007 (pre-dating this blog), following the annual Tour of Historic Homes that featured the Stevens’ House pictured predominantly on the left. The structure in the distant center was identified at the time as possibly that of 402 Avenue E.
Referring to the Sanborn Insurance Maps of 1905, and seeking second opinions, I am certain now that the home pictured in the distance is the subject structure of so much community discussion and emotion. Missing is its beginning as a family home. Victor A. Marshall is listed as living at “402 E” in three directories, 1903, 1904 and 1905. The 1900 Census has Victor as head of household, age 46, owner of the home and his occupation as a proprietor of a shingle mill. Family members include his wife, Minnie, age 31; Virgil, age 10; George, age 7; Mary age 4; Maurice, age 2; and a nephew, James, age 20, from Victor’s birth state of Ohio. Snohomish County property records indicate the home was built in 1896. By 1920, Victor, now 66 years old, is listed as a widow and border living in Seattle with a job described as “Mine owner.” His first born, Virgil, is 40 years old in 1930, and has been married to Grace for 18 years. They are living the good life, we imagine, in San Francisco — he working in the automobile industry, and she as a bookkeeper with a wholesale tobacco company. Brother George, also living in San Francisco, but in a hotel, still single at 37 years old, and selling insurance. The third boy, Maurice is 32 in 1930, listed as head of household but single, working as a Real Estate salesman. First daughter and her mother’s namesake, Minnie, doesn’t show up in the records until 1940, age 38, living with her 13 year old son, Dudley as a single mom in a rented home on Bush Street in San Francisco, and working as a waitress. Daughter Mary married Raymond Hatch in Spokane in 1917, and their son Marshall was born the following year. In 1930, age 11, he was living with a relative named Holmes When the boy turned 21, he married Helen Rupp, also 21 years old, living in Seattle, but no record found of any children. My search for living descendants ended there. Going back to the beginning of this census synopsis, pre 402E, the parents, Victor and Minnie turn up in a 1884-1887 Washington Territory Census, where he is listed as 30 years old, working as clerk; while his wife Minnie Marshall is 18 years old, born in the Territory to a mother from Missouri and a father from New York in 1869. Snohomish was the county seat then, though barely a clearing on the north bank, 12 miles up the Snohomish River. But by the time their first child, Virgil, was born on October 28, 1890, Snohomish had been an Incorporated City for three months, with a counted population of 2,012 residents. The passionate discussion around 402E repeated the refrain that the developer was an outsider, looking to make buck. But it’s a song of irony since the town of Snohomish was founded by an outsider looking to make a buck. E. C. Ferguson came from the east coast via Steilacoom with first, plans to soak the military with a ferry service crossing the river; but when that scheme sunk, he showed up anyway in 1860 to live on his claim with enough supplies to build our first saloon. The location of the property at 402 Avenue E is legally described in part as “Fergusons 2nd Add to Snoh.” This was land Ferguson was holding back from selling until the arrival of the railroad (1888). Editorials in “The Eye” often chided Ferguson for not developing his land holdings between Avenue D and the Clay Addition to the west. Council member J. S. White, representing Ward 1, had to bring a lantern with him to council meetings in order to light his way through Ferguson’s dark land to his home on Avenue H.
By the time the Marshall family was living at the corner of 4th and E, Ferguson was doing a land-office business. In the end though, a home is not about price but about the family stories it holds and the memories the Marshall family members carried with them into the world – memories of their childhood adventures amongst the stumps, for example. Then Save the Date: Sunday, April 21, 2013, for a workshop on using WordPress software which I use to publish this blog — to be held at the Snohomish Library, 2-4p — follow this link to download the details! This entry was posted in Posts and tagged 402 avenue E, 402E, E. C. Ferguson, Snohomish WA history on April 15, 2013 by warner. 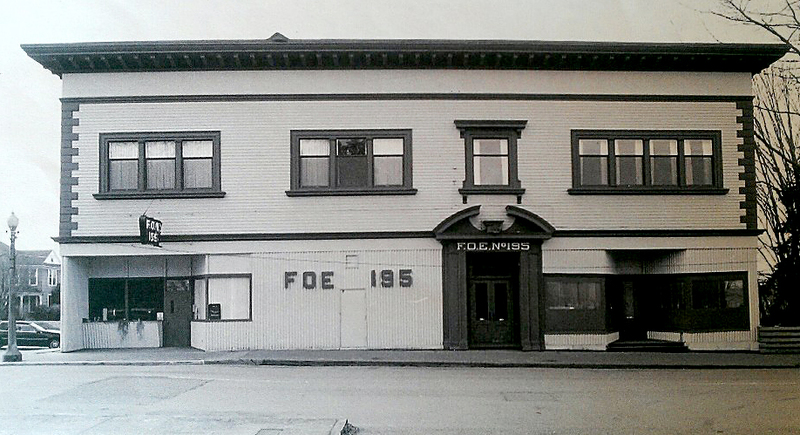 The Fraternal Order of the Eagles building was at the time, 1904, Snohomish’s largest building. It was dedicated two years later with a grand ball for 1,000 members and guests. The second floor features a ballroom with a floating or suspended dance floor, boasted as the first in the Northwest. At street level the robust structure features large plate glass windows, creating inviting storefronts that were quickly leased, we imagine. But now, seen for the first time, we have a photographic record of Harmon’s first store in the Eagles Hall, which we mentioned in last month’s post. The Snohomish Historical Society is fortunate to have a small collection of glass plate negatives produced by the prolific photographer Lee Pickett, who after years of travel, made the town of Index his home base. His former home is a cozy, jam-packed museum today, well worth a Sunday drive east. 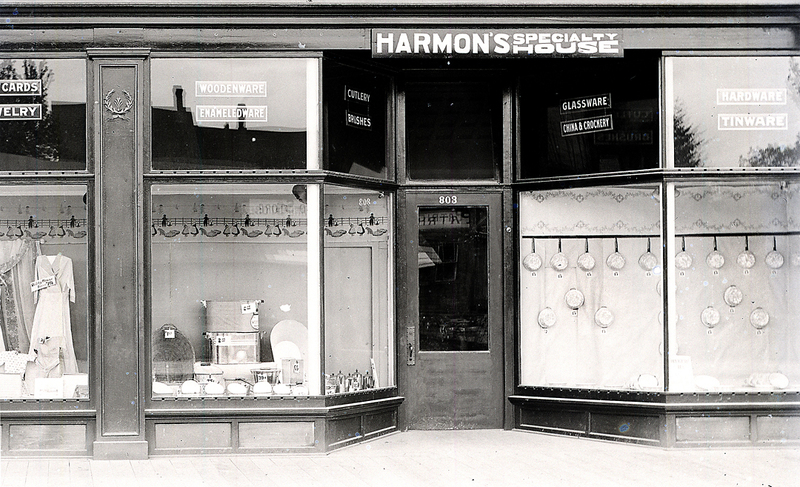 Two of the three glass plates of the Eagles Hall were broken, yet both show Harmon’s Specialty Shop with clear detail. I have not had much luck scanning the plates, but the history happy elves of the Northwest Room, David, and Lisa, (also known as Everett Public Library staff members), came to my aid. I am grateful — it’s very exciting to have these images to share. A third plate shows the Eagles Hall at an earlier date when a dry goods store occupied Harmon’s space — did Harmon buy the partners out? We will show that image next month as we continue to celebrate the renovation of the Eagles Hall after its long hibernation of emptiness, and welcome its new businesses located in one of Snohomish’s still largest buildings. This entry was posted in Posts and tagged eagles hall, Snohomish WA history on March 19, 2013 by warner. The 1916 image of the Snohomish River covered in snow, published last month, was taken from the roof of the Marks Building, which I understood was Harmon’s Department Store at the time — a Snohomish institution that I wanted to know more about. Coming across an ad in a 1923 issue of the Snohomish County Tribune, I learned that Raymond Harmon did not move his operation to the Marks Building until 1921. The family history of the store, as reported in a 1973 issue of the Tribune, places the move in 1914 or 15 — a continuation of a family fabrication of convenience. Raymond Harmon and his wife arrived in Snohomish in 1913 from Wisconsin with the plan of continuing his trade as a mercantile merchant. He took a storefront space in the recently completed Eagles Hall (801-807 First) “where he sold out his stock by 3 o’clock in the afternoon on the first day of business,” so goes the family lore. He called the store “Harmon’s Specialty Shop,” and the ads offered corsets at “… new lower prices,” along with “Perfect Fitting Union Suits — Ask for Munsingwear, never say underwear.” The name seems to have been shortened to “Harmon’s” shortly after the move to the Marks Building and Raymond’s sister, Jessie Hauff, joined the business as a partner. The store layout famously featured a ramp that divided women’s apparel on one side and clothing for gents on the other. I am wondering if any readers remember the wooden rocking horse that children could ride down the ramp? Sounds dangerous. Raymond died in 1945, a short six months after his son-in-law Harold Harkins began working at the store. Walt Canfield, who worked at Harmon’s for 38 years, helped Harold learn the business, along with Raymond’s widow Grace. Harold’s success can be measured by the move in 1964 to a larger facility in the old Safeway Store at 611 Second Street, current home of the Senior Center’s Thrift Shop. The business remained at this location until it closed the doors for the last time in October 1989 — the same month that Raymond moved his operation to the Marks Building 68 years earlier. Follow this link to read more about the images of the Marks Building and the 1916 snowstorm. This entry was posted in Posts and tagged harmons, marks building on February 19, 2013 by warner. 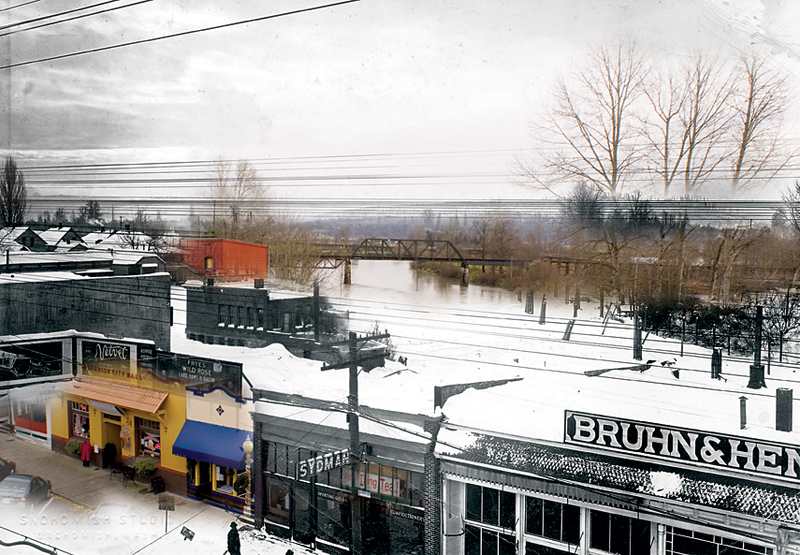 There are reports of the Snohomish River freezing — 1880 and 1893 come to mind — but it was not until the record snowfall of 1916, that a photographer, standing on the roof of the Mark’s Building, (1024 First), captured our river stilled by a blanket of snow. Thanks to the Minisoft Company, current owners of the historic Mark’s Building, I was given access to follow the unknown photographer up the ladder to the roof to take a repeat shot and captured only another wearisome, wet, winter day on the river. But still beautiful, like an aging relative all bundled up in a familiar raincoat. Combining the two shots taken 97 years apart, then highlighting the “then and now” parts, I ended up with an informative composite photograph with which to begin our sixth year writing the Then and Now column. Beginning in the lower, left hand corner, at the ochre storefront, now a sweet shop and hair saloon, (1009 First), this Spanish flavored structure was built in 1927 as our first City Hall on what was then an empty lot. Evidently, it had been empty long enough to erect a temporary wall of four billboards. Ah, the days of unfettered capitalism. Perhaps the intention of the billboards was more altruistic than simple ads, but were meant to minimize the unsightly view of the Snohomish Steam Laundry — the industrial looking structure just left of center. “Give your wife a rest — have her send her laundry here,” reads an ad in a 1925 issue of the Snohomish Tribune. In addition to city government, First Street welcomed the nascent motion picture industry with a first class theater built by Lon Brown, two doors up from the new City Hall. Its grand opening was in October, 1924, with a screening of “Hold Your Breath.” Its red stage house seems to hover over the steam laundry in our composite image, but there was in fact room for both, between First Street and the river. Back on First Street, the Everything Tea Shop (1015 First), is located in the only structure pictured in 1916 photograph that is still with us today. The Bruhn and Henry Company, the next door neighbor in 1916, followed the railroad workers to town and stayed for good long runs at two locations on First. We do seem to associate heavy snowfalls with memories, even of childhood, which in turn becomes the stuff of poetry. The famous 1916 storm was written about last year here. This entry was posted in Posts and tagged Frozen Snohomish 1916, snohomish snowstorms, Snohomish WA history on January 15, 2013 by warner.